First, a big thank you to Buddha Teas for sending me a sample of Buddha Teas Saffron & Green Tea. Buddha Teas is an up-and-coming tea company focused on returning tea to its natural state. Founded in 2009, Buddha Teas offers tea-drinkers a wide variety of teas from the typical green or black tea to herb and tea combinations to straight herbal teas. The company uses organically grown or wild harvested tea and herbs. Their products are also free of GMOs, MSG, artificial colors, flavors and preservatives. Buddha Teas uses recycled paper for their boxes and unbleached paper for their tea bags. They plant 5000 trees each year through their “Teas for Trees” campaign. It’s nice to see a company being true to their founding principles and following through on their commitments as they continue to grow! Saffron is the dried stigmas of the Crocus sativus, a small bulb plant. The flowers arrive in the autumn within a 2-week window. Workers must collect the stigmas each day as the flowers quickly wilt. It takes up to 75,000 flowers to make 1 pound of dried saffron thus making saffron the world’s most expensive spice. Used for thousands of years in the Middle East and Southwest Asia, saffron is now mostly used throughout the world as a food spice and dyeing agent. The health properties of saffron continue to be studied. From Buddha Teas’ website, they state “[s]affron is a natural source of riboflavin and folic acid, along with protein, essential fatty acids and crude fiber.” Additionally, saffron is used for asthma, high-blood pressure, heart disease, and many other health problems. After reading all sides of the lovely black and red box of Buddha Teas’ Saffron & Green Tea, I couldn’t wait to have a taste. Per the directions on the box, I used boiling water and brewed the tea for 3 minutes, which was the minimum brewing time. At the 3-minute mark, when I sampled the tea, the flavors had not developed in the boiling water and I tasted only flat, hot water. As the tea cooled, the Saffron & Green Tea flavor came out with a bang. If you really like saffron, then this is the tea and the brewing method for you. I also tried the Saffron & Green Tea as iced tea. The ice tea was refreshing with a strong saffron flavor. For both of these methods, hot and iced, I missed the organic green tea flavor. So, I tried a different method for brewing another cup. As you’ve been reading about here on Tea Answers, green tea is usually brewed differently from black tea. To see if I could bring out the organic green tea as an equal partner to the saffron in Buddha Tea’s Saffron & Green Tea, I heated another pot of fresh water to 190°F (a little below boiling) and brewed the tea for 1 minute. What a difference! I could taste the organic green tea. Without taking a backseat to the saffron, the organic green tea worked with the saffron, melding into a rather nice cup of tea. 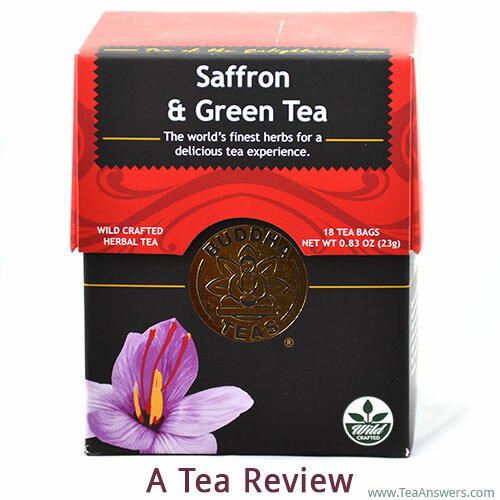 True to Buddha Teas’ packaging, the Saffron & Green Tea had no artificial flavors or colors. After removing the tea bag from the teacup, I could see strands of saffron inside the tea bag. They oozed out a lovely yellow-orange color much like having a sunrise in a tea bag. Add this to the positive mission Buddha Teas has to support your health and the environment, and you have a great reason to try this tea. You can buy direct from the Buddha Teas website or from Amazon.com.